Welcome Morning | Homespun Haley. When I am deeply distressed, mourning, or upset, I tend to take greater notice of mundane details. The texture of a chair, the smell of a room or the shape of a table leg. I’m not mourning but I’m empathetic to a fault at times. I’ve been following the Storm Sandy news really closely. I can almost imagine myself there. Having to leave my home, knowing the rushing water will wash it away. Hearing about a neighbor or friend-of-a-friend who was hurt or killed. Trying to calm my family and my own heart. Grief, pain and fear. I’ve been praying for those who are living out the worst of this storm. Even though I am over 2,000 miles away, I’m absurdly confident is God’s ability to traverse that distance pretty quickly. I slept poorly, knowing thousands of others were probably not sleeping well either. Being in this frame of mind allows me to see those life-details that are so easy to miss. And in turn, I am feeling appreciative of the texture, smell and look of my life. Simple. Mornings. Coffee. Water. Laundry. Light. Pillows. Clouds. Drawers. Bread. Walks. I walked into our bedroom and saw Gideon, sprawled out, not a single burden to carry. I thought of this poem. A perfect reflection of my mood. The joy that isn’t shared, I’ve heard, dies young. 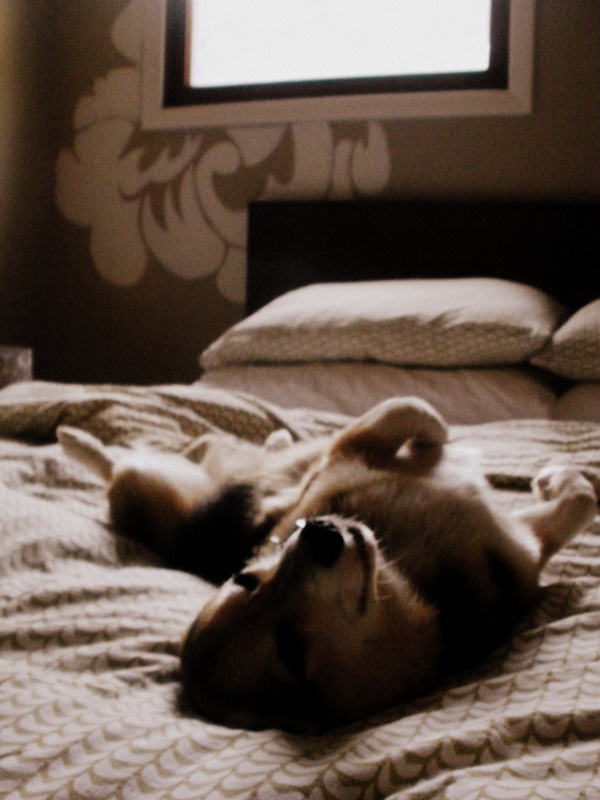 This entry was posted in Corgi, Life, Our Home, Pets, Uncategorized and tagged care, Corgi, details, dog, gideon, life, pain, poem, sandy, sleep, storm by Haley. Bookmark the permalink.